Before you run away screaming, the first thing you need to know is that it is not nearly as difficult as it looks. In fact it is fairly easy to make some really cool designs while learning about patterns, lines, and shading. This activity would be great for indoor recess, free time, read-aloud time (if you allow students to draw), and possibly even to calm down an agitated student, as it tends to be a calming activity. I am going to give you the basics here, but if you want to really get into it, there are several books and many websites to help you along the way. There are tons of ideas for patterns (and how to draw them) or you can just make up your own. 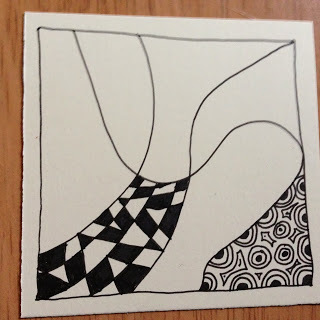 The easiest way to draw a Zentangle is to make it in a 3.5 x 3.5 inch square. Use decent paper so that your pens don’t bleed or show through on the other side. And speaking of pens, these ones work really well and are the ones that the Zentangle folks recommend. 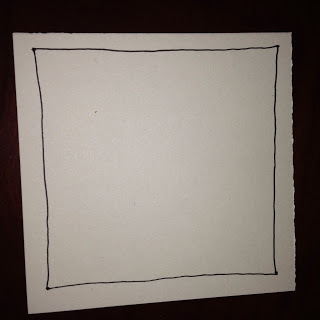 Begin by making four dots in the corners of the paper and connecting them to make a square. Don’t use a ruler. 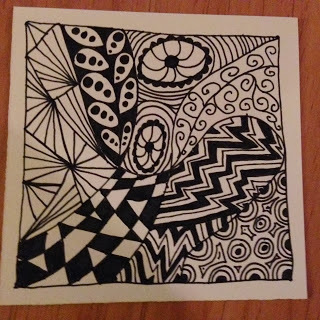 Zentangle is not about being perfect. The Zentangle folks say to use a pencil for this part, but I was taught to use a pen, and I still prefer it that way. But a pencil might make you feel more comfortable with the process. Then start filling in the sections with designs or patterns. You can get ideas for patterns from books and from the web. This site has a ton of patterns with step-by-step instructions for drawing each one. Or you can just make up your own or do a combination of both. Here is the same one with all of the spaces filled. When you have filled in all of your spaces, you will want to use a pencil to shade parts of your design to create some depth. Simple, fun, and kind of addicting. Give it a try, either for your own sanity or with your students! Looking for a place to start? This book will tell you everything you need to know. 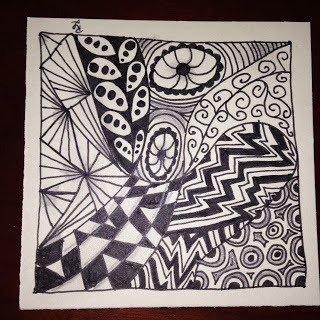 *Please note that I am not a licensed Zentangle instructor (yes, they exist) and in fact am only a beginner. There is a whole 11-step process that the creators of Zentangle advocate. This is just a little starter course for those who might be interested. It is all you really need to create Zentangles, but if you want to go deeper, get a book or take a class. I am not very artistic but this looks like something I could manage! Head some about Zentangles then, I looked it up. It is pretty interesting. Wanting to do this myself to destress! Can I use fine tipped Crayola markers? I can't afforded to buy enough packs of the fancy markers but don't want to spoil the effect. I would love to do this, but do not have time to do anything extra that is not connected to curriculum. Ideas? The funny thing is that I have done this since I was very little. I never knew it was something that actually had a name! 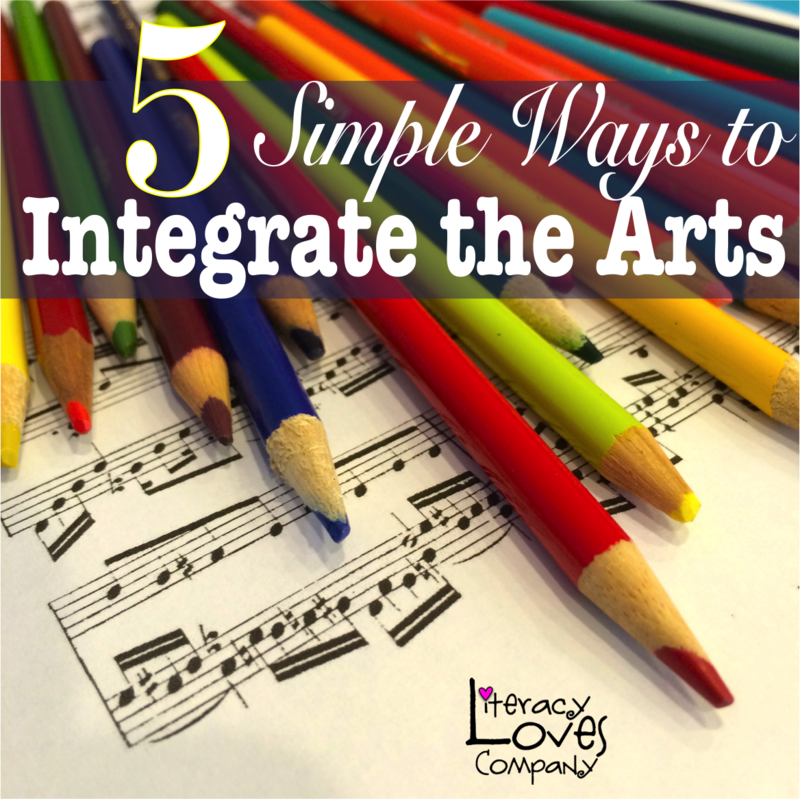 I even taught my children to do this when they were young–just to doodle and be creative. Jen – I would just use whatever you have available. Anything is better than nothing. I just did it for a group art project on big pieces of clothe with fabric pastels and it was fine. Maybe use bigger squares. Krista – If you spend half an hour teaching it, kids could do it at indoor recess, during read-aloud, or just for fun at home. Fantastic! Thanks for posting this. Just placed an order with Amazon! This is such fun and so easy. It is so easy to pick up to work on when time permits. Lovely pastime and thanks for giving me the basics to get started! 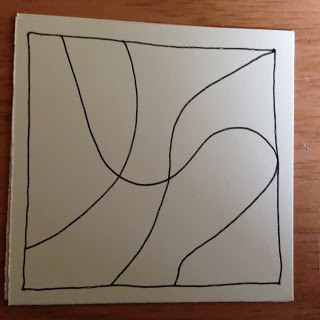 Krista asked about curriculum connections – I fit in a lot of math art while imbedding some math skills that we need to cover. We do line designs and students have to mark all the quarter inches on the ruler first and check a partner's work. Then they are allowed to do the cool design. We do starburst drawings and measure the angles with a protractor before coloring. You could probably use some geometry skills with this too. It's a very cool idea! Just wanted to note that the frame and string, when following the traditional method, should be done in pencil. These lines are guides. The artist is therefore not confined to them as you are once they are entered in ink. You will find tiles that are pre-strung. Those strings are "penciled" in if you will in a light gray. This. allows sections to be combined if desired. Children catch on to this quickly in my experience. 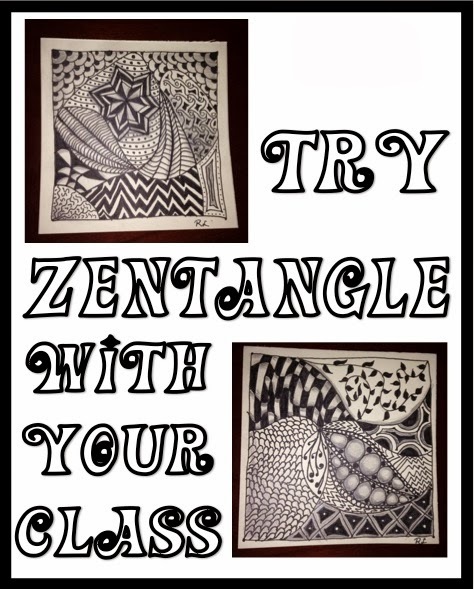 Oh, I also meant to mention that there is as special kit & curriculum available through a CZT or directly from a Zentangle, Inc. at Zentangle.com. Is the black and white for effect? I was wondering if anyone had ever used the black against colored paper.